And What's More, You Get Full Master Resell Rights To Them As Well! So, where does that put you? *Installs with just a few clicks. *Allows you to create a website without knowing any HTML. *Add content simply by typing directly into the interface or by copying and pasting it in. *Can easily change the look and feel of any site through templates. *You can have multiple categories for easy browsing and higher search engine positions. *Comes complete with it's own RSS feeds. *Automatically informs various other services (pings) when you add, or update your content. Wordpress makes creating your own, low maintenance websites a breeze - and better yet - the search engines loves them! So that's why Wordpress can literally be your best, and closest friend, at least when it comes to launching your own websites. account, select the theme, and click save. These beautiful, exclusive niche blog themes are all included! Grab The Master Resell Rights to This Incredible Package At No Extra Cost! the Master Resell Rights to Exclusive Wordpress Themes so you too can make money by reselling the themes to your clients or customers. using your own Paypal / 2CheckOut / Clickbank account. 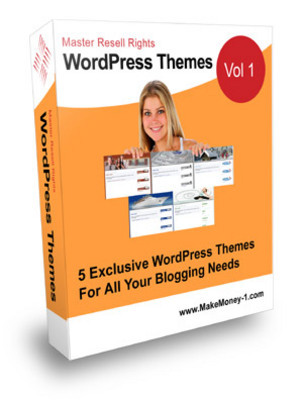 Wordpress Themes Volume #1 now - and stand to profit massively from your investment! You'll get 5 complete themes, and also the Master Resell Rights to the entire package.